A truck drives on the main road linking Hodeidah with Sanaa, Yemen, Sept.13, 2018. The World Food Program (WFP) said humanitarian workers, warehouses and food stocks in Yemen's port city of Hodeidah have come under attack in recent days, jeopardizing vital assistance programs. The WFP warns the rapidly deteriorating security situation in Hodeidah is threatening its life-saving operations for hundreds of thousands of people. Last month, the WFP provided emergency food rations to around 700,000 out of 900,000 people at extreme risk. The WFP reports several serious security incidents have occurred since Wednesday. It said the Red Sea Mill Silos, which mill a quarter of the WFP's monthly wheat requirements, came under attack. A mortar shell launched by an unidentified armed group also hit a WFP warehouse holding enough food for 19,200 people. The agency said a guard was injured. WFP spokesman Herve Verhoosel told VOA none of the food was stolen, but, for security reasons, he said WFP has not been able to use its trucks to transport and deliver the food to the hungry. "It is very important that … every party respect the work of the humanitarian — that WFP or other agencies are not used politically or militarily for any reason," he said. "We are there as a neutral party to help the population in need in the country. And, hunger is, of course, one of the most important problems for the moment. We need to find a way to deliver the food to the people in need." Verhoosel said 46,000 tons of wheat are expected to arrive in Hodeidah within the next week-and-a-half. But he fears ongoing clashes could jeopardize the shipment. WFP reports more than 8 million people in Yemen are facing starvation and warns any disruption to the food supply could push many over the brink. U.S.-backed Yemeni government forces have been fighting al-Qaida-linked militants in the country for years. 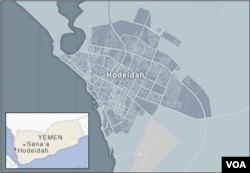 The port of Hodeida is held by Houthi rebels. Crucial humanitarian aid goes through the port, although the Yemeni government accuses the Houthis of using the port to smuggle weapons.